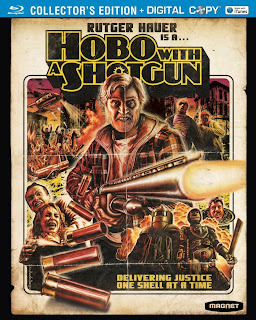 Last week Hobo With A Shotgun arrived on DVD and Blu-ray. And if you've got a decent home entertainment rig then you owe it not only to yourself but anyone who may enjoy watching movies at your place to get the Blu-ray, 'cuz this is hands-down the most gloriously gorily beautiful film that I've yet see to show off the capabilities of high definition. 'Course, the movie itself is excellent! I got to see Hobo With A Shotgun at ActionFest a few months ago and ever since it's become entrenched in my mind as already being a classic in its own right. As you may know Hobo With A Shotgun began as Jason Eisener's winning entry in a contest for Quentin Tarantino and Robert Rodriguez's movie Grindhouse in 2007. The competition called for filmmakers to submit their best fake grindhouse-style trailers. Lo and behold, a lot of people thought that the Nova Scotia native's Hobo With A Shotgun was probably the best part of Grindhouse! With a growing swell of demand for a full-length film, Eisener and his crew got studio financing and went full-tilt wacko with it... and the resulting film is nothing short of a triumph! Well, I bought the Blu-ray when it came out last week and having watched it three times now, I love Hobo With A Shotgun more than ever before. This is increasingly in my opinion a morality tale about personal responsibility, about trying to make something better for yourself, about taking into hand what God has given you to force the world to make sense when it refuses to act rationally, dammit! Right out the gate and Jason Eisener has turned in a film as thought-provoking as Stanley Kubrick's A Clockwork Orange and even more ultra-violent at that. The story that Eisener and screenplay scribe John Davies have crafted would have accomplished that on its own... but putting veteran actor Rutger Hauer into the role of the Hobo was the perfect act of casting. Hauer plays the Hobo with stoic poise and grim determination. It's hard to see Hauer's Hobo as a character who wants to be a bloodthirsty vigilante: all he wants is to save up enough money to buy a lawnmower so he can start his own landscaping business. But the Hobo just can't turn a blind eye to the reality around him: a fact that comes into especially sharp focus during that scene in which the Hobo looks upon the preciously innocent newborn babies in a hospital's maternity ward. I bought this Blu-ray for the movie. I couldn't have possibly imagined how overwhelmed I would be at the picture and sound quality. There are shades of red and blue and green on the Hobo With A Shotgun Blu-ray that you wouldn't even think were possible (especially the red). This is the sickest palette of color that I've seen in any home video release and if you wanna show off what your high-def set is able to do, then you can't do much better than Hobo With A Shotgun. The sound quality is also exceptionally gruesome... and I mean that in a good way! In addition to the feature film, Hobo With A Shotgun Blu-ray is loaded with extra features. More Blood, More Heart: The Making of Hobo With A Shotgun is a documentary chronicling the strange long journey of the movie from original concept to competition entry to full-gauge motion picture. That original Grindhouse trailer is also included, as well as a lot of material involving David Brunt: the original Hobo (he cameos as one of the corrupt cops in the film). There's enough bonus stuff to merit it being on a separate disc, and yet it's all very thoughtfully incorporated into the same disc as the movie (particularly with the interactive "Shotgun Mode"). Hobo With A Shotgun on Blu-ray is a bloody awesome addition to one's personal library, and one that will certainly be getting lots of play. Highly recommended!